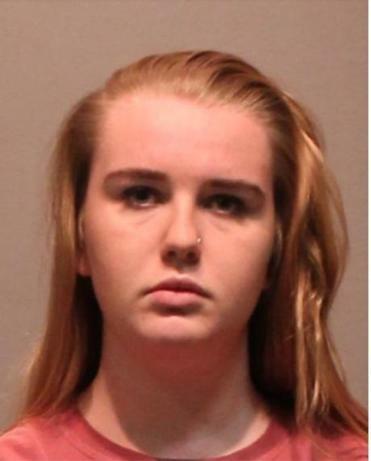 Brianna Brochu, 18, was arrested for tampering with her roommate&apos;s personal property at the University of Hartford. A University of Hartford student who was arrested after allegedly bragging online that she meddled with her roommate’s personal property — including putting bodily fluids on and in certain items — is no longer a student there, according to school officials. Brianna Brochu, 18, was initially charged with criminal mischief in the third degree and breach of peace in the second degree, West Hartford police Sergeant Michael Alquist said. Police requested that a charge of “intimidation based on bigotry or bias” be added Wednesday when Brochu appeared before a judge in Hartford Community Court, according to The Hartford Courant. According to police, an officer was dispatched to the university in mid-October, following a report of “vandalism [and] harassment issues” between two roommates at the school. Brochu also shared pictures to the social media platform that showed some of the property that she allegedly tainted, according to the report. The post has since been deleted, but screenshots have been shared widely online. Police said Brochu’s roommate, who is black, said she experienced “severe throat pain” and “felt the pain was a result of Brochu’s tampering” with her personal belongings. “I can finally say good-bye Jamaican Barbie,” Brochu said online after her roommate moved out last month, The Courant reported. Brochu confessed to police that “she licked the victim’s plate, fork, and spoon, and smeared her own bodily fluid on the victim’s backpack” but denied the other actions she posted to Instagram. She allegedly told police she wrote those things to “appear funny,” according to The Courant. In a Facebook Live video recorded Monday, the student who identified herself as Brochu’s roommate shared her experience living with the suspect. The video had been viewed nearly 700,000 times as of Wednesday afternoon. The victim expressed frustration about the way university officials were handling her complaints. She said she didn’t find out about the incidents involving her roommate until after she moved out of the room. The victim was alerted to Brochu’s Instagram posts by other students, she said.